NASA image (top) by Jeff Schmaltz, LANCE/EOSDIS Rapid Response. NASA Earth Observatory image (bottom) by Joshua Stevens, using modified Copernicus Sentinel data (2017) processed by the European Space Agency. Caption by Pola Lem. 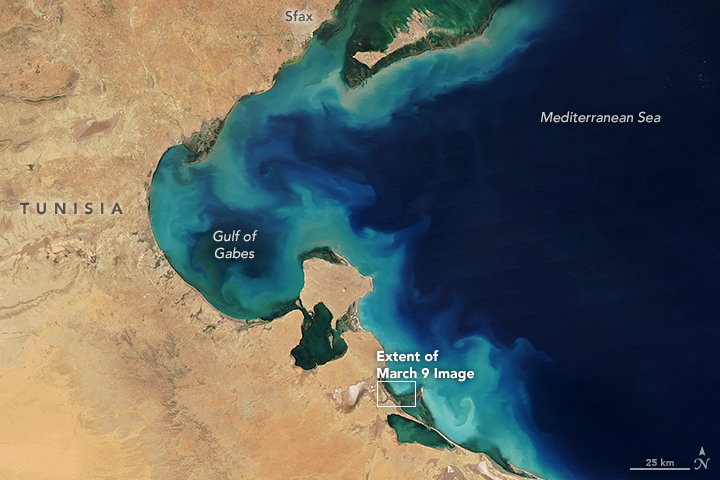 On March 18, 2017, the Moderate Resolution Imaging Spectroradiometer (MODIS) on NASA’s Aqua satellite acquired a natural-color image of what appears to be a phytoplankton bloom off the coast of Tunisia. It is also possible that the discoloration is from sediment. Upwelling of deeper, nutrient-rich waters can cause such blooms, which provide marine life with a source of food. Other times they are fueled by nutrient runoff from rivers and coastal waterways. Most blooms are benign, but some can become harmful when they consume too much of the oxygen in the water or when the phytoplankton species are toxic. 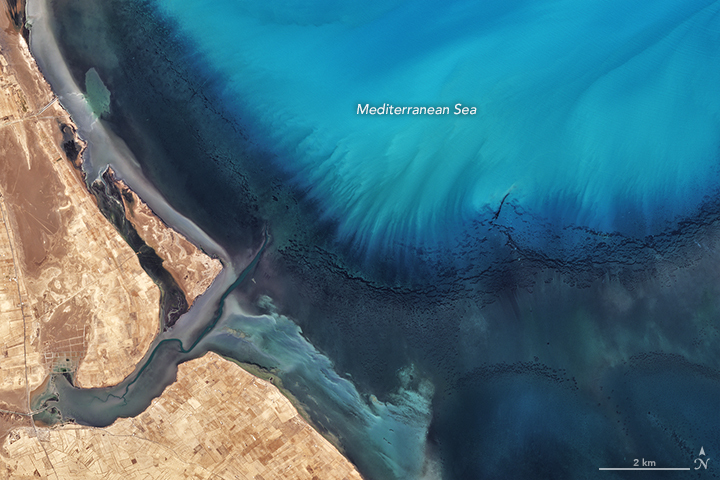 The second image is a closer view of the sea about 15 kilometers (9 miles) south of the coastal city of Zarzis, acquired on March 9 by the Multispectral Imager (MSI) on Sentinel-2. Overfishing and phosphate pollution from industry have led to lower fish catches off Tunisia’s coast in recent years, according to recent studies. 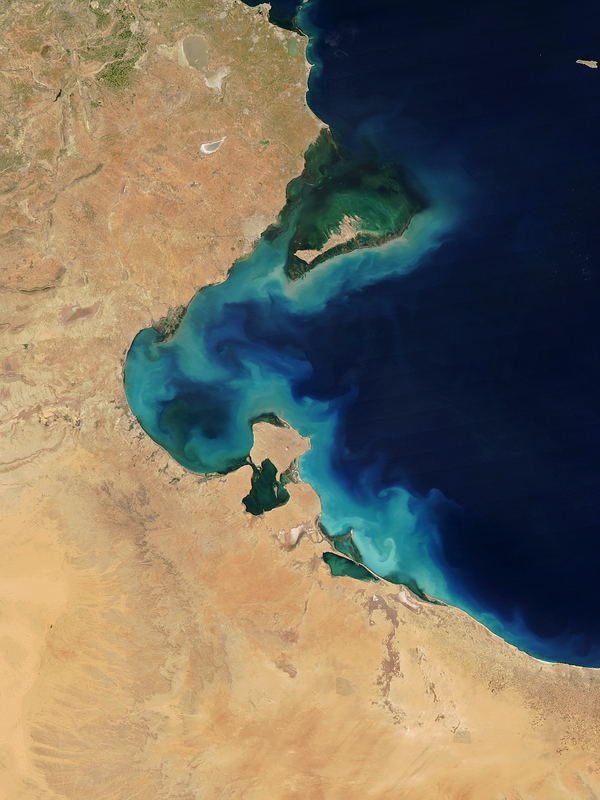 An increase in inorganic compounds (found in fertilizers) have been linked to sporadic blooms in the Gulf of Gabes. In addition, warmer-than-average water temperatures and lower wind speeds in the area occasionally create ripe conditions phytoplankton growth. NASA Earth Observatory (2016, July 2) Bloom in Lake Okeechobee. NASA Earth Observatory (2015, August 9) Blooms off Both North American Coasts. 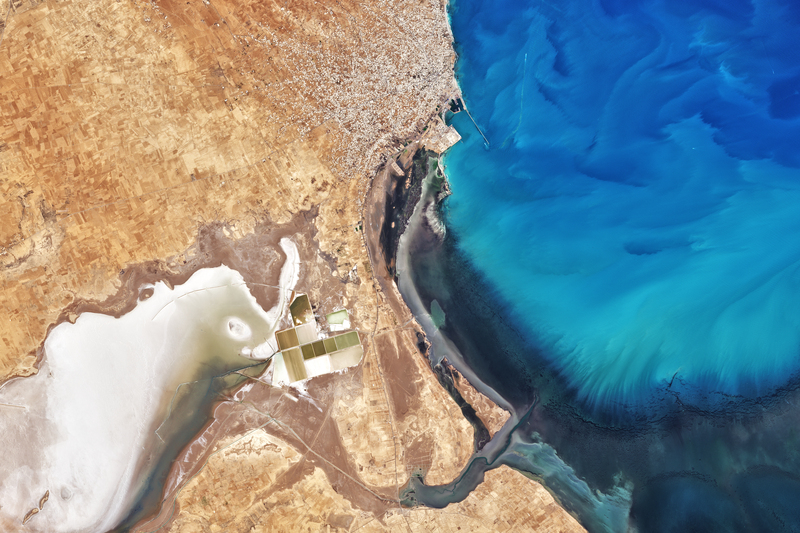 NASA Earth Observatory (2010, August 14) Carthage, Tunisia.